"It can be a difficult journey. If you have a cold, cough or sniffle, don’t even bother lining up. Good hiking boots and a walking stick are a must. Bring plenty of water. Be sure to stay at least 25 feet away. Remember these are wild animals. If we need to carry you out, that will cost an extra $300." I was already intimidated by the pre-trek briefing and we hadn’t even started on our mountain gorilla expedition, which was part of a 16-day tour to southwestern Uganda sponsored by ElderTreks. The 25-foot rule, I learned, was for both their protection and ours. Sharing 98.4 percent of our DNA, the gorillas are very susceptible to human-borne illnesses. We were carriers and they had to be protected from us. They were wild animals and we had to be protected from them. A fair quid pro quo. Thus, eight humans a day are allowed to visit a gorilla group for no longer than an hour. Works for us; works for them. Gorilla trekkers ascending one of many steep climbs. This is not exactly a drive-by photo op. 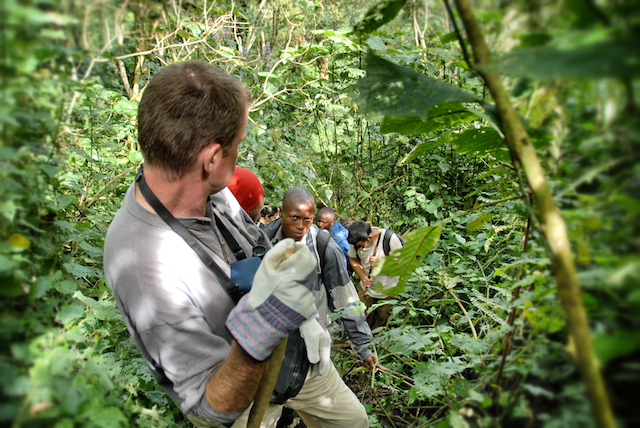 With a vigorous trek of 1-7 hours, depending upon where the gorillas are that day, you have to REALLY want to see them. But even with visitation restricted to an hour, it is usually well worth the effort.